Well this is a bit exciting! Particularly as I’ve been needing a pick me up for my eyes lately (I have some more great eye-treatment finds coming later this week!). 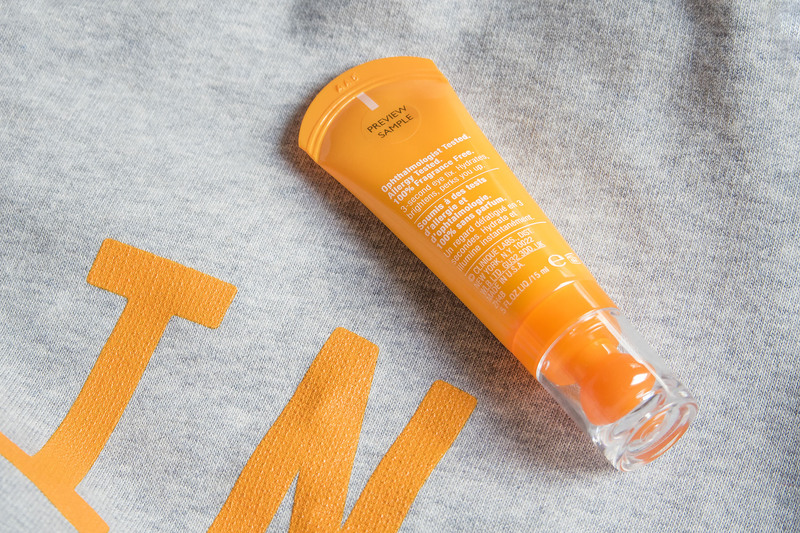 The new Clinique Pep-Start eye cream is all about instant high-impact brightening as well as long term treatment benefits – all in a funky new tube. The campaign is all about #ImIn and is about being ready for anything from 9am until 9pm, although I don’t know about you but I’m usually ready for anything way outside those hours as well! 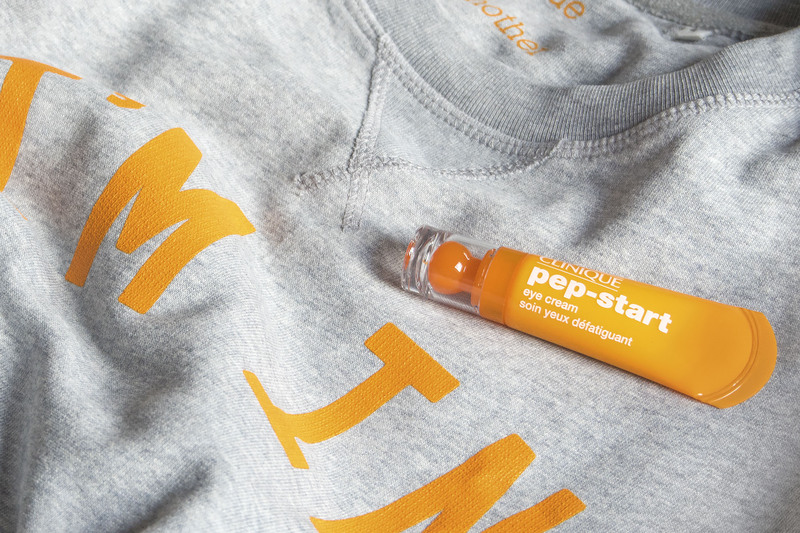 Clinique sent the new Pep-Start with a cool jumper which I obviously had to share on Instagram. According to Clinique, #IMIN apparently! So what’s it all about? Firstly there’s the bizarre tube. It’s not the most intuitive packaging I’ll have to be honest; I was squeezing and twisting before having to resort to the press release to discover that you need to pull up the ball and then squeeze a small amount of the product onto it. Then begin massaging into the eye area. 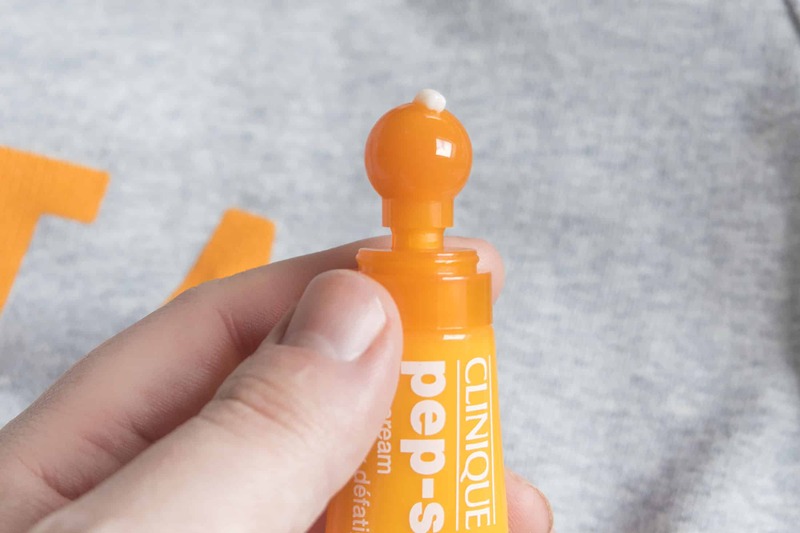 I also don’t know how I feel about the plastic applicator in favour of the metal-rollerball used in the Clinique For Men anti-fatigue cooling eye gel. But, it does a good job of applying the product. Now the product itself is gorgeous and exactly what you’d expect from a Clinique eye cream; smooth, hydrating and leaving the eye area well protected. There’s a gorgeous pink/purple sheen to the cream which immediately brightens the eye area and increases the skin’s ability to more uniformly reflect light, therefore making your eyes look instantly brighter – I definitely noticed a difference! I’ve not been using the cream long, only since last week, so I’ve only really been experiencing the immediate benefits; but when waking up the skin under my eyes feels much smoother and less gagging for moisture. A comprehensive blend of peptides helps to firm and protect the skin including: Acetyle Hexapeptide-8, Palmitoyl Hexapeptide-12, Palmitoyl Tripeptide-1, Palmitoyl Tetrapeptide-7, Trifluoroacetyl Tripeptide-2. These are proven to help stimulate natural collagen and elastin production, plumping up the under eye area and restoring elasticity. I’d always say ingredients like this help but don’t expect miracles. Whey Protein, rich in amino acids helps to firm the skin around the eye area, further plumping it up. It’s also a great protectant. Soya Protein also helps deliver moisture where it’s needed. Caffeine, Magnolia Bark and Algae extract then help to sooth the under-eye area as all three are known, powerful anti-irritants, helping to calm redness and inflammation. Phytospingosine helps to reduce the pooling of under-eye fluids and helps to increase lymphatic drainage which lead to the dark discolouration and puffiness. Molasses Extract helps to brighten the eye area and works as a skin protecting antioxidant. Finally Spindus Mukurossi Extract and Caesalpinia Spinsoa Gum work to increase the skins production of ATP, increasing cellular energy and therefore speeding up skin cell turnover to make sure the brightest, freshest cells are always on show. Clinique Pep-Start Eye Cream launched last Friday for £22 nationwide and is available from most department stores including John Lewis, House of Fraser and then here directly from Clinique UK. This article first appeared on MANFACE written by Thom Watson. It was published on Tuesday 2nd February 2016 and was last updated on Monday 3rd April 2017 at 1:12pm. It's categorised under Clinique, Eye Care where you'll find more related content.